If you were to ask anyone who has been around Columbia County for a while “where is the best place to get wine?” more than likely they would have said “go to the Vineyard.” The Vineyard Wine Market has been a staple in Evans for 13 years. From that success, Vineyard owner, Roger Strohl, has joined forces with locally celebrated Chef, Justin Hayes. This partnership has combined both Strohl and Hayes’s passions to form Cork & Flame, a unique combination of fine dining, tapas and a world-class wine market. When you first arrive at Cork & Flame, you enter into the Wine Market, which offers a selection of over 400 wines. The wine market holds regular business hours during the day but after 5 pm., guests can order from the tapas menu to enjoy while they select the perfect bottle of wine. The Wine Market also hosts wine tastings on Friday and Saturday evenings from 5-7 pm. The wine tasting include a flight of wine and charcuterie. Those wishing to dine in the dining room are in for a real treat. The menu boasts what they call Progressive American Cuisine, which they describe as “cuisine that emphasizes local or regional ingredients and traditions, often augmenting these with elements from haute cuisine or international fare.” Chef Hayes says 80 percent of their menu is cooked over and Argentinian Style open flame Grills, which is featured prominently in the open kitchen. Guests can also order any of the 400+ bottles of wine from the wine market to have with their meal in the dinning room. If the wine market and Argentinian Grills were not enough to set Cork & Flame apart, there are several other features that make this a unique dining experience. First, Cork & Flame showcases local and regional artists. From the dinnerware, to the wall art, and even the table tops. No detail here is left unattended. Second, they offer the most extensive vegetarian menu in the area. The vegetarian menu is cooked on a separate grill. Therefore, vegetarians can be sure their food selections are not exposed to any non-vegetarian menu offerings. Lastly, on Friday and Saturday nights, guests can dine at the Chef’s Table for an eight to twelve course meal featuring wine pairings. The Chef’s Table can be booked for up to 12 guests. 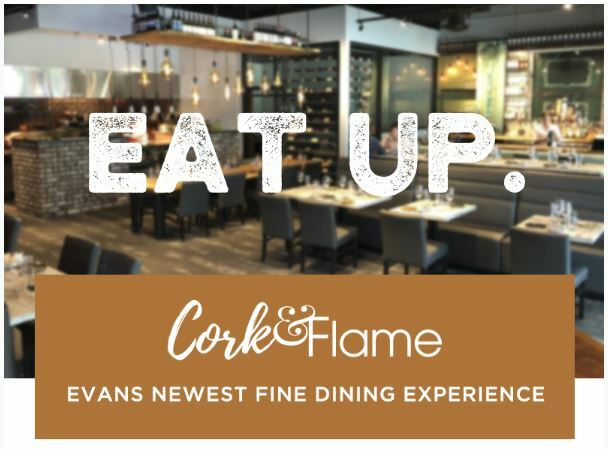 While in Columbia County, make sure you experience Cork & Flame for one of the most unique dining experiences. Reservations are not required, but strongly encouraged. To view their wine market hours, menu, and to make reservations,visit their website. For a behind the scenes look at Cork & Flame, watch our Facebook live video.